I have a Lenovo 3000 J series desktop. I installed a new Western Digital 500GB hard drive. I tried to install Windows 7 pro 64bit and Home 32bit both installations went fine. I installed the network driver and Windows 7 imediatly tried to install 2 security updates then needs to restart. When it restarts it goes imediatley to "Repair Strtup" and can't repair. I have tried several times and the same thing always happens. Has this happened to others? Is there a way to install Windows 7 on this computer? Hello sir, are you currently using the computer in question now? I have it running next to the computer I am using to chat. Yes, It still goes to startup repair. I can get to that window if I boot from the installation CD, but it's not the window that it automatically goes too. during installation, did you delete all of the partitions on your harddisk, and install windows on a fresh new partition ? you will see this part during installation, in the dialog box which says "where do you want to install windows "
I started with a new unformatted hard drive. Then deleted all partitions each time I tried the installation. It will install to the desktop and seems to be fine until a restart and then it goes to neverland. I have a service appointment I need to get to. I'll check back later to see if any suggestions have been offered. Hi. My name is XXXXX XXXXX I"m happy to assist. Try doing the install a little differently. Install Windows 7 Home first and do all updates so it is stable. Use disk management to resize the partition so that you have a new volume to install Win 7 Pro. The example attached uses Vista instead of Win 7 Home to show what you'll see before installing Win 7 Pro. Thanks for your help Byron. I'm not trying to install Pro and Home. I have tried to install each of them at different installations. I have also tried 64bit and 32bit. Each clean installation goes back to "start-up repair" after the first restart. If I don't restart. I can work on the new installation indefinitely. Something is happening at restart that is corrupting the hive and I cant figure what is doing it. I'll be out on service calls most of the day. I'll get back to trying more magic later in the day. Hi. Now I understand a bit better. I just did a little checking on the pedigree of that machine. Seems it came with Windows XP around 2006. This looks like a driver issue. The 3000J came with a large number of different configurations between Intel and AMD. Not knowing the specific model check above to find yours. Download the drivers to another machine then install them on the Lenovo before restarting. Thanks for the URL. It came in handy. I did as you said and installed all the drivers before any restart. 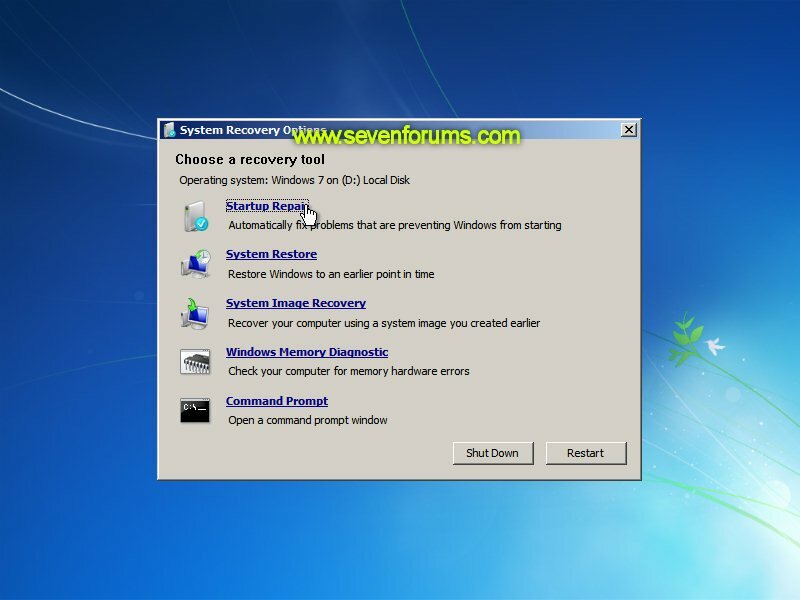 All was going well and I had successfully installed many of the Windows 7 updates when I restarted the computer. It looked like it was going to boot correctly. It was almost to the login page when it said, "Windows is shutting Down." It then processed to to reboot again to the "Start-up Repair" and failed. The 1 error listed in the details was "MissingOsLoader". I have put the hard drive in my shop computer to search for clues as to these failures. I tried looking through log files but can not find why this keeps happening. Do you have any suggestions on where I can find the boot information that will show at what point the error happens? Microsoft has a tool for diagnosing and fixing boot problems. (Bootrec.exe) You can see how it's used here: http://support.microsoft.com/kb/927392/en-gb Click the + sign next to Bootrec.exe Options. There are several things you can use it to rebuild like the MBR and BCD store. You'll need a Vista or Win 7 install disk. Thanks for your input. I think it's a lost cause. I spent a lot of time last night getting everything installed and then BLAM, it happened again. I pulledx the hard drive and replaced the winload.exe file. It booted a little further and said another file was missing or corrupt. I replaced that file and got a little further into the boot-up. After doing this several times I realized that this was going to take hours if not days and there is no guarantee that it won't happen allover again. I may tie into it again some day but for now I have too much other work to do to spend any more time on this one. Thank you for the rating and bonus. I'm still trying to earn it. I had a customer recently who was running a Win7 laptop but wanted to put XP on it to run legacy software his company still uses. It turns out that XP wouldn't run on it because driver support for XP on that hardware was never developed. So, he installed Win 7 back to the machine, put on service pack 1 and did the updates. The machine was continually getting bluescreens and basically was unusable. I found out, at the end, that the memory in the laptop was not the original memory that came with the laptop. The customer still had the old sticks. When he put them back in everything was fixed. What can you tell me about the memory in the Lenovo? My Toshiba Qosmio G50 64bit Vista Home Premium Laptop has frozen on start-up. I have 32 bit windows 7 Home Premium upgrade on my system. I am having trouble with pro toos m-powered 8 and my computer.